We at Brand Web Direct, encourage you to use email signatures which act as a kind of promotion for your business, every time you send an email to someone. You may boast your new business website or even include the custom logo design in your email signature. Step 1: Open Outlook and click on Tools from the top menu. Then select Options (or Email Options) in some versions of Outlook. Step 2: Now click on the Mail Format tab on the top of the window. Step 3: Click on Signatures. It is generally towards the bottom of the mail format tab. Step 4: Click on Signatures. Step 5: Click on New and enter a appropriate name for your signature. If you have more than one signature for different purposes, name them accordingly. Example: BrandWeb Contact, BrandWeb Sales etc. Then click OK. Step 6: Now you can type the desired text you wish others to see in your signature. A current standard text is as follows: You may wish to copy this text and edit it to suit your requirements. You may wish to use the formatting options in the formatting tool bar to make your text look more attractive or change the font or other alterations to your signature. Step 7: Click OK and Exit the Window. 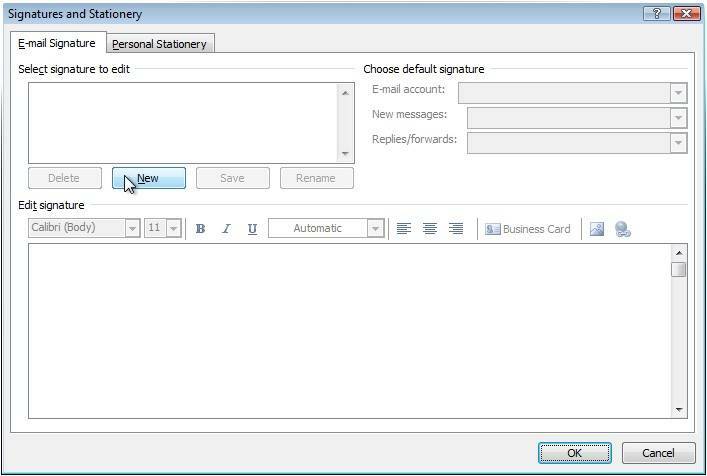 Step 8: In some versions of Outlook, you would have to select which email signature to use with which email account. This is normally when you have more than 1 email accounts configured on yoru machine.